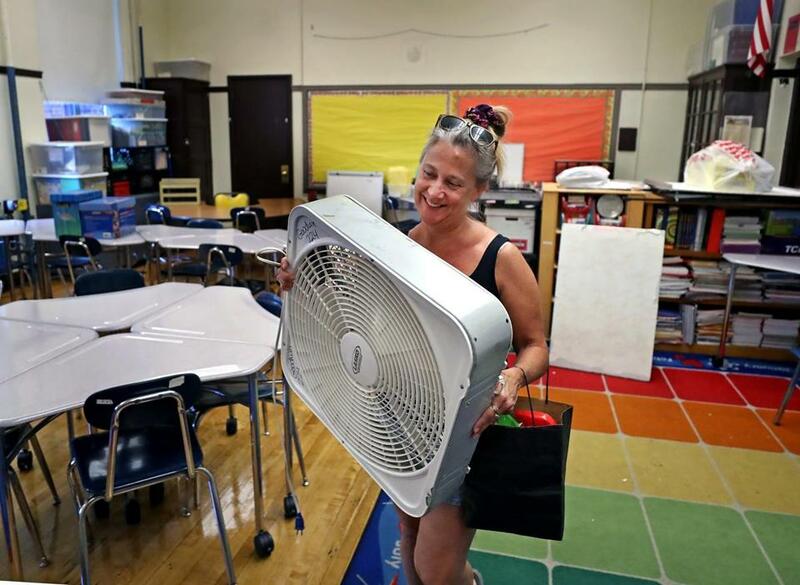 Fourth-grade teacher Meg Goodwin brought her own fan to her classroom at the Thomas Edison School in Allston earlier this month. Only 33 out of 125 Boston public schools are equipped with central air conditioning. That means when school resumes each September, many classrooms must cope with sticky, humid conditions — for a few days or weeks, perhaps. The city says it is committed to expanding air conditioning in schools. On hot days, it ensures schools have additional fans and water. One local teacher, Michael Maguire, is pushing for quick action — and has issued a challenge. He has called on the mayor and schools superintendent to shut off central air in administrative buildings until all schools are equipped with it. Metro Minute asked Maguire, who teaches Latin at Boston Latin Academy, how heat affects learning. Q. What happens in the classroom when it’s too hot? The kids get listless. Instead of acting out, they shut down. When you’re writing stuff, paper sticks to your hands. Everything becomes a little bit more of a challenge. It just becomes lethargic. If you were running a kennel, you wouldn’t put dogs in 90-degree rooms and give them no exercise, or movement, or fresh air. But that’s what we’re doing to students. I don’t think it’s fair. In this 21st century, we can and should give kids climate control. Q. Is installing central air worth the one or two hot weeks you get a year? This is where I started to change my tactic. If it’s only one or two hot weeks a year, turn off your air conditioners, superintendents and mayor. No one is going to do it because it’s not one or two hot weeks a year, it’s 10. I’ll give you today [Tuesday]; most people might say is not hot, but it’s 81 degrees in my classroom. These old brick buildings retain heat and humidity. It’s sticky and nasty in the building. The air is stifling hot. When they rebuilt and renovated the Bolling building, the headquarters for the BPS, they put central air in. It can be done. I think the kids are worth it. Q. Why do most schools not have central air? The vast majority of our buildings were built before World War II; air conditioning didn’t exist then. Many of the big buildings, like Brighton High School or Boston Latin Academy, were up on a hill. If everyone opened up their windows, you’d get somewhat of a cross-breeze. Over the years, different types of windows have been installed, called safety windows. They don’t open up, they tilt in. There’s no cross-breeze, there’s no good ventilation. Q. Do schools without central air do enough to help students when it’s hot? The adults in charge really understand and do the best they can. But if you look at the high-stakes testing, teaching and learning are lost. All we’re doing is baby-sitting the kids. You put them in a room and it’s hot; you might put on a movie. It just becomes existing through the day. The older kids can rationalize, but I feel badly for the younger kids. School’s supposed to be a warm, nurturing place — unfortunately it’s very warm. They’ve got red faces when they are dropped off at dismissal. That’s really what started it for me, when I picked up my own kids at their elementary school and they are all beet-red.